Perhaps I should have been suspicious when I saw that there was a prime spot still available at the park so late in the day. It had everything we were looking for: an oceanfront setting, a big shade tree, and a barbecue grill. I pushed a stroller full of picnic supplies over to the table, plopped down in my folding camp chair to nurse the Kiddo, and waited for Sean and our friends to arrive. 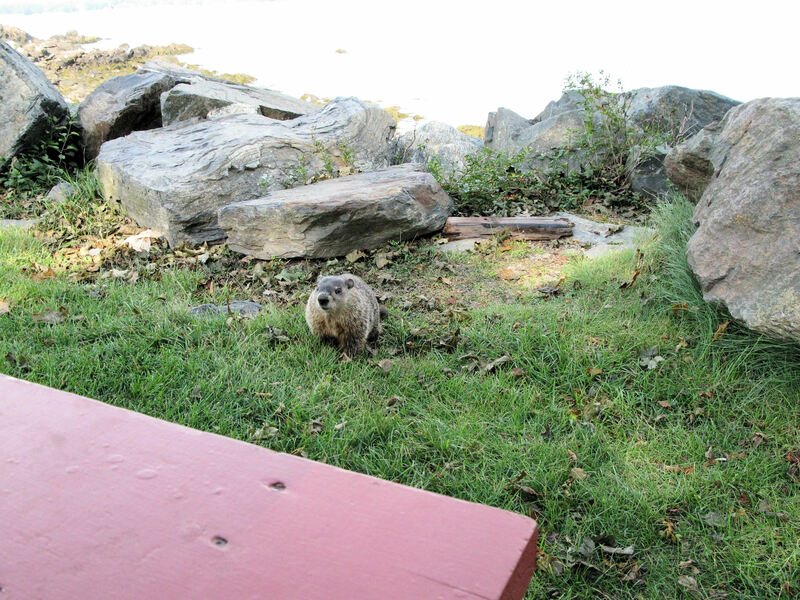 A few minutes after I got there, I discovered that the site had something we weren’t looking for: a resident groundhog. He (or she?) popped out of the large boulders that marked the beginning of the rocky shore, and gave me a steely glare. And then charged straight at me. 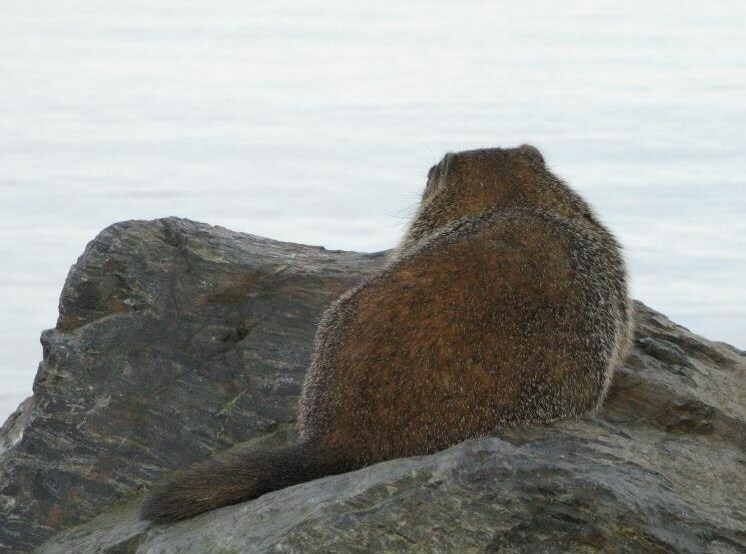 I didn’t know it at the time, but some concentrated googling later that evening informed me that groundhogs are actually very aggressive creatures who will fight to the death to protect their young or their homes. There was no clear reason for this one to find me threatening, unless he just didn’t like babies, but he very quickly violated what I consider my safe wildlife proximity zone. I figured if I had to I could probably manage to jump on top of the picnic table, even while nursing, or perhaps scoopkick him back over the rock wall. I too am a fierce creature when defending my young. Fortunately, it didn’t get that far. I managed to turn him around by vigorously waving a cloth diaper in his direction, and he scurried back to the wall, where he proceeded to munch on some deadly nightshade. It was an uneasy truce for a while, but he finally moved off down the park when the rest of my group arrived. It sounds funny, to talk about being threatened by something that appears as harmless as a groundhog. People have all seen footage of Punxsutawney Phil being lifted out of his burrow to make friendly predictions about the weather, and assume groundhogs are cuddly little creatures. Though they can be “tamed”, it takes a lot of work to do so, and they are wild creatures with powerful claws for digging burrows and teeth sharpened by gnawing on vegetation. Not something I want to tussle with. I tried to imagine the life of this particular groundhog. He had to endure harsh weather along the seashore. His burrow likely flooded during the recent storms, and I wonder where he went during the storm, if he had to huddle in the woods at the edge of the park waiting for the waters to recede. 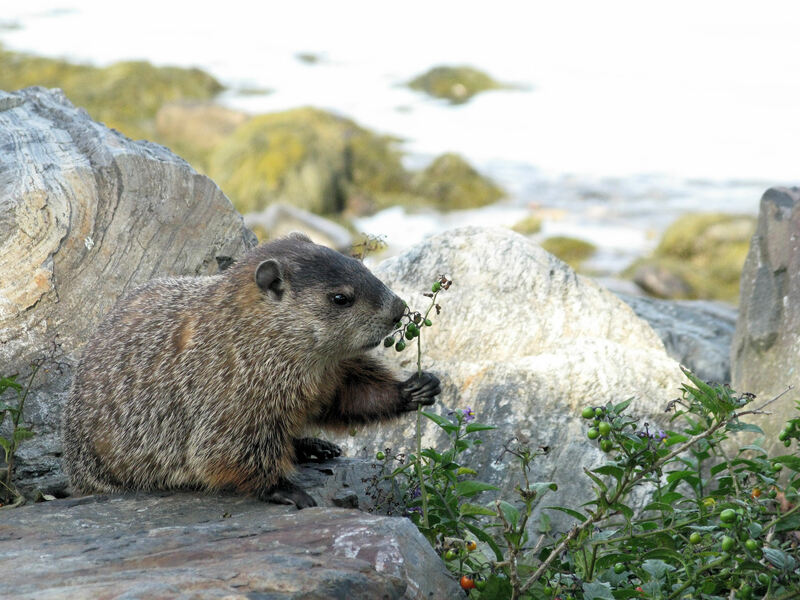 In the winter he hibernates, but the soil on the coast must be rocky and hard to dig. A few moments after he left our site, some kids from another table started to harass him. They threw watermelon rinds at him, and dared one another to try and get closer; they laughed and screamed each time he charged them, oblivious to how deadly serious the creature was taking their “game”. I imagined day after day of this. No wonder he tried to scare me away. We barbecued quietly and enjoyed a great evening of fine conversation as the sun slipped down behind the trees. After a few hours we left the groundhog in peace to reclaim his territory.